There are many different types of outdoor furniture types—wicker, wrought iron, aluminum and plastic—but wood is by far the most popular. Whether you go with an opacity that allows your wood furniture’s natural grain to show through or opt for an opaque solid in your choice of 3,500+ colors, a fresh stain on outdoor furniture will yield a great new look. The first step in staining or painting outdoor furniture is to make certain that the wood is absolutely dry and free of mold and mildew. Be sure to check the undersides, too. If the old surface has stains from mold or mildew, you can properly prepare the surface by using a premium cleaner like Benjamin Moore® Clean (318). For mild cases, you can mix up your own solution using one part of household bleach to three parts water (it's best to do this outdoors or in a well-ventilated area.) Be sure to rinse the furniture and allow it to completely dry before applying the stain. If the old painted or stained surface is still intact after sanding, you can skip priming. 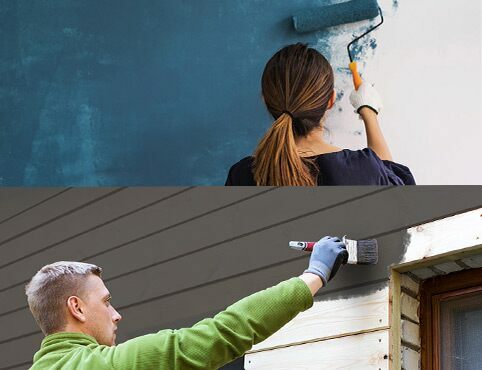 However, if you're going to apply a lighter color over a dark one, if the wood is exposed, if there are knotty sections, or if any stains remain, you should use a high-quality primer formulated for outdoor use, such as Benjamin Moore's Fresh Start® High-Hiding All Purpose Primer (046) or Arborcoat Oil Primer (366). 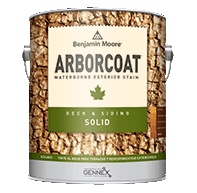 The full Benjamin Moore portfolio of 3,500+ colors is available in Solid stain ARBORCOAT® Solid (640). If you have wicker furniture, wrought iron patio furniture, plastic outdoor furniture, or questions on painting any other type of outdoor furniture, visit your local, independently owned Benjamin More retailer to get expert prep instructions and product recommendations.